This page is about the medium tank M1 Abrams. For other uses, see M1 (Family). The Tank, Combat, Full Tracked, 105-mm Gun M1, or just M1 Abrams, is a Rank VI American medium tank with a battle rating of 10.0 (AB/RB/SB). It was introduced in Update 1.77 "Advancing Storm". In game, the M1 Abrams is a fairly quick main battle tank. It accelerates quickly, and will hold a speed of 32 miles an hour over rough terrain. On city maps or paved surfaces, an M1 Abrams can easily reach its top speed of 45 miles an hour, thanks to its monstrously powerful turbine engine. With three speeds in reverse, it is also capable of an impressive 25 miles an hour to back away from troublesome situations. As powerful as the motor may be, the M1 Abrams has a slow to respond, and relatively slow traverse rate for its neutral steering. In some circumstances, it may be more beneficial to back away before turning around, as waiting for the neutral steering to turn 180 degrees is lengthy. The M1 Abrams also suffers from a raised engine deck- As such, its capacity for “over the shoulder” shots and shots directly over the rear is very limited, because the engine deck prevents lowering the cannon. Turret ring is 50.8 + 50.8 mm thick. 19 mm RHA plates are positioned behind the front fuel tanks. 19 mm RHA plates surround the turret rear ammo racks. Ammo racks of the M1 Abrams. If you must advance, advance facing forward after checking for enemies. As long as your armour faces the enemy, you have relative safety. When defending, go hull-down. Make sure there are places to retreat to if needed, and take advantage of the reverse speed and smoke grenades to run from ATGMs. Use the rangefinder when you can, but if the target is moving, you will probably miss. Try to guess based on experience if it comes to it. 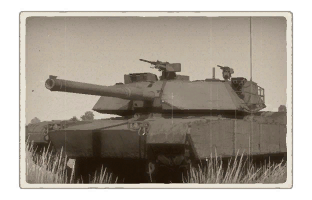 The Abrams main strength its its extreme mobility, even by MBT standards. However, the price comes in protection; the Abrams is quite vulnerable, and struggles to deflect incoming shells with anything except its turret cheeks. Additionally, The M1 has somewhat sub-par penetration even with its best shell. Because of these factors, it is recommended that you do not use this tank as a front line brawler. Instead, use your speed to quickly appear from angles your opponents are not expecting you to come from. This can take the form of flanking in order to get side shots, Rushing at the start of the game to take an advantageous position, or getting to choke points before the enemy does, in order to be ready to knock them out. Essentially, This tank should be played much like the M18 Hellcat at Rank III, though unlike the Hellcat it is not impossible for your armour to help you occasionally. 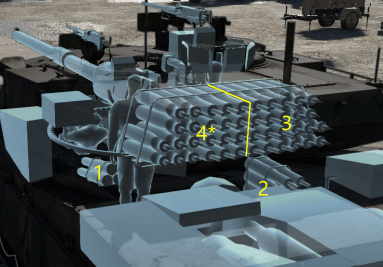 A useful thing to note when playing the Abrams, and most MBTs in general, is that if your opponent shows any side armour, you can penetrate them almost every time. if someone is coming towards you even at a slight angle, aim for the the front drive wheel on their tracks. Your shell will be able to penetrate into the tank and likely one shot kill them. It is recommended to use APFSDS as the main loadout, as the HEAT-FS ammunition starts coming against tanks with armour types specifically designed to resist it. Most tanks at its Battle rating, due to the relatively poor armour. Type 90 and AMX-40, as their incredibly powerful shots can penetrate you anywhere, at any angle, at almost any distance. The T-80B, because of its strong armament and very strong armour. it can be penetrated through its lower front plate, the drivers viewport below the gun, and just to the side or below the gun. If a T80B shows any of its side, you can penetrate it there. Very good mobility for its weight. Good chemical protection from composite armour. Turret also has composite armour on the side. Turns very fast, even in neutral steering. Internal armour plating helps with increasing the crew survivability. Very accurate main gun with very good gun stabilizers and good rate of fire. Great forward and reverse speed. Blowout panels protect the crew from ammo-racks detonation. Although composite armour is absent on the upper glacis plate, the extreme sloping makes shells bounce everytime. The three shells under the gun do NOT have blowout panels, if detonated you will die. No composite armour on the upper glacis plate and in the rear of the turret, so remaining on level terrain is priority. Low APFSDS penetration compared to Challenger 1 and T-64B. Inadequate stock ammo loadout; Both the M735 and M456 shells are no longer effective at top rank. Weakest composite armour compared to Challenger and T-64B. Losing some crew members will prevent you from firing some of your smoke grenades. The armour's chemical resistance against HEAT and such is not relevant against contemporary enemies usually equipped with APFSDS. 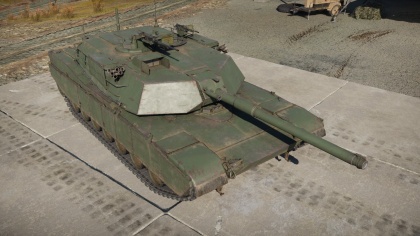 Skins and camouflages for the M1 Abrams from live.warthunder.com. This page was last edited on 26 March 2019, at 06:44.